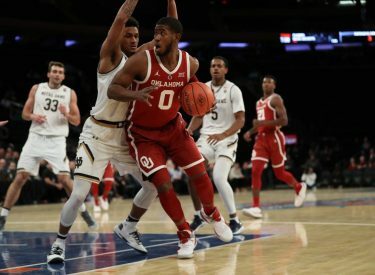 NEW YORK (AP) – Christian James scored a game-high 25 points and grabbed 10 rebounds to lead Oklahoma to an 85-80 win over Notre Dame in the first game of the Jimmy V Classic at Madison Square Garden. Oklahoma improved to 7-1 with its third straight win. Brady Manek chipped in with 17. Aaron Calixte finished with 12, and Matt Freeman had 11.